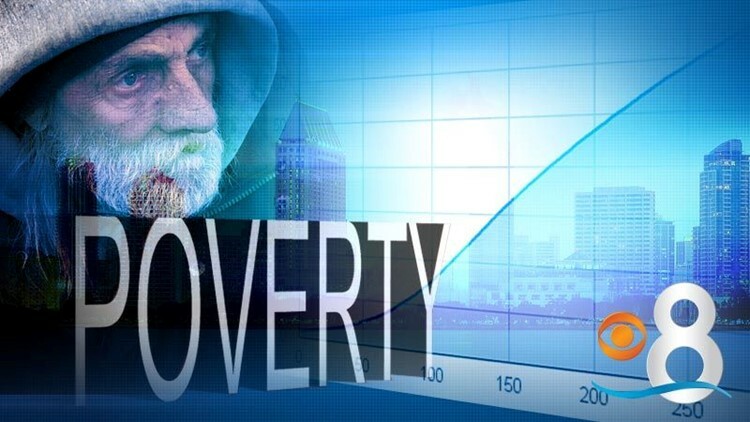 SAN DIEGO (CNS) - The poverty rate in San Diego County is increasing, and pockets of concentrated poverty are growing outside of urban areas, according to a study released Thursday by the National University System Institute for Policy Research. Using U.S. census data, the institute took figures from the period covered by the 2010-14 American Community Survey, and compared them to 2000. The countywide poverty rate in 2010-14 was 14.7 percent, compared to 10.8 percent at the beginning of the century. The highest rate was 25.8 percent in El Cajon, an increase of 9.1 percent. National City was a close second at 24.5 percent, a 2.5 percent hike. The NUSIPR said concentrated poverty -- defined as an area with at least 20 percent of the residents living below the federal poverty line -- was a growing concern, especially in the suburbs. In El Cajon, the portion of low-income residents living in concentrated poverty neighborhoods rose from 6.2 percent to 9.9 percent. Increases were also seen in Chula Vista and Escondido. However, the number of impoverished residents in San Diego, the region's largest city, decreased from 63.5 percent to 51.2 percent, the NUSIPR found. "Highly concentrated poverty makes it even harder for individuals and families," said Erik Bruvold, president of the institute and author of the study. "Not only are individuals facing the challenge of overcoming individual circumstances but highly concentrated poverty imposes additional burdens." Among those burdens are higher crime rates, lower-performing schools, fewer nearby job opportunities and worse health outcomes, he said. Bruvold said the spread of concentrated poverty outside of the inner- city puts stress on both smaller jurisdictions and the county government. Overall for San Diego County, the portion of poor people living in areas of concentrated poverty rose from 42.1 percent in 2000 to 45.6 percent in the more recent period, according to Bruvold.